A photo slideshow of the loading and transport is located at the bottom of the page. Click here. With the boat located on the south shore of Massachusetts, in South Dartmouth, I faced hiring out a potentially expensive transport. Fortunately, my regular transporter, Steve Morse of Morse Overland Marine in Gray, ME provided me with a fair quote, so this initial cost ended up being lower than I had expected. 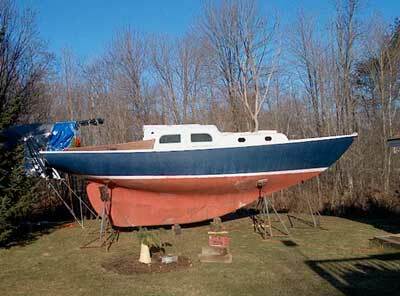 In any event, the boat had to be moved to my backyard, so it's not as if I had any choice in the matter. Over the two-week period between my decision to purchase the boat and the actual transport, we struggled to find the perfect day to undertake the trip. Large amounts of snow would have been a problem, since the boat's location at Jeff's house (her former owner) was well in the backyard, and had there been more than a couple inches of snow--or, worse, a severe warm-up that would turn the top several inches of ground into a soupy mess on top of the still-frozen underground--it would have been impossible to retrieve the boat. Likewise, I hoped for no snow at the Maine end so that the boat could end up in a location that, while far from ideal, would at least be out of the way enough for the time being. We finally set Monday the 23rd as the date, and the forecast was perfect. I agreed to meet Steve down at the house in MA at between 1130 and 1200 or so, so I drove down a bit earlier, giving me a chance to look over the boat again and take care of the paperwork with Jeff. Boy, I thought southern Maine was getting crowded (and it is), but all it takes is a trip south of the border for me to appreciate how much worst it could be. Traffic wasn't a problem on the way down, but when I got off the highway near Jeff's house--which exit happened to take me near a large mall--it suddenly became clogged with desperate and unhappy shoppers darting around to finish their long-procrastinated shopping. Everyone seemed to be in a friendly Christmas mood--NOT! What a bunch of rude people. But I digress. Anyway, I reached Jeff's house without incident at about 1030, and we walked out back for a look at the boat. Although I had seen the boat on a couple occasions, never had I really looked her over closely, or without at least some amount of tarpage over her decks. For the past two weeks, I had been looking at the single photo of the boat that I had in my possession, a non-descriptive port bow view that did nothing to show the true condition of the boat. In fact, it made her look pretty good, and I had a series of second thoughts about my destructive (though ultimately life-saving) plans for her. Once I got close to the boat in person, however, these fears evaporated. She was rough, beat, ridden-hard-and-put-away-wet for sure. 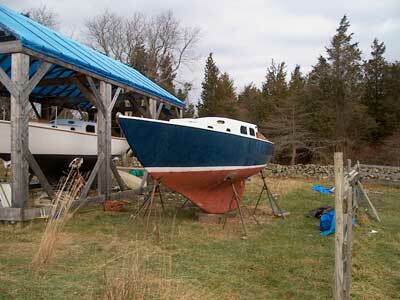 The hull was one thing--sad and tired looking, but it took little vision to see past the weary paint. On deck, however, my initial concerns about trashing something that shouldn't be disappeared instantly. The deck and interior are, simply put, junk, and cutting everything away later will be a pleasure. See more photos of the boat's initial condition here. After some time on board, we returned inside for coffee and paperwork, then settled in to wait for Steve. He finally arrived at about 1230, a bit later than planned, but still fine. He backed his rig into the yard, and there soon became apparent a problem, something I had noticed as soon as I arrived earlier, though there was nothing I could to: there was a pretty large ledge protrusion right in front of the boat, and it seemed so large that I wondered more than once how in the world the boat got dropped where it was in the first place. Obviously, it got in there somehow; logically, it should be able to get out again. After a few various angled attempts, Steve tried going straight over the top of the rock, but the trailer kept hanging up the more he backed in. even if he had been able to get the trailer far enough back under the boat in this manner, I was concerned that with the boat in the trailer, he'd never be able to pull the rig off the rock where it was stuck. He obviously had his own concerns about this method too, since he gave up and came in from the sharp front angle again. This time, he removed the bow center stand along with both side stands, since there was no other way the boat was going to get loaded. Of course he did this carefully and slowly to make sure the boat wouldn't tip forward--it didn't. The next issue at hand was a combination of two factors, both of which conspired to leave the boat very low to the ground: first, she was blocked pretty low to start; second, the blocking had sunk into the ground a bit, lowering things even further. In order to get a metal keel bar across and underneath the keel to support the weight, Steve had to first raise the boat enough with the hydraulic pads and a strap run beneath the very aft end of the keel between the trailer sides. He obviously is used to this sort of problem, and got the boat raised without fanfare. Once the keel was properly blocked--just on the ballast, of course, not the false keel--things were good to go, and after loading the blocking and jackstands onto my truck and his, he was off, off and away, wasting no time hitting the road north. It was about 1330 when he left; I departed a short time later and caught up to him within 20 miles. I didn't bother staying with the truck, preferring to get home on my own accord and prepare for the truck's arrival later. It was pitch dark when we arrived in Maine at my backyard--I arrived about 30 minutes before Steve, who showed up at about 1715. As a result, I have no pictures of the unloading. Still, this was much easier than the loading; I had a spot picked out to starboard and forward of Glissando, which would leave enough room for us to pull Glissando out for launching in the spring without the need to move #100. It was so dark it was hard to tell what attitude the boat was taking, fore and aft and side to side, and as a result she ended up pitched too far forward and anything but level. That's OK, other than the (to me) annoyance of looking at a cockeyed boat for the next 6 months, since this location is not her ultimate resting place--just a stopgap until I find other accommodations, or at least until Glissando goes back in the water in May. By next fall, #100 will be ensconced wherever she's going to spend the next period of her life--her rebirth. The next morning, I shot some pictures of the boat in her new location. 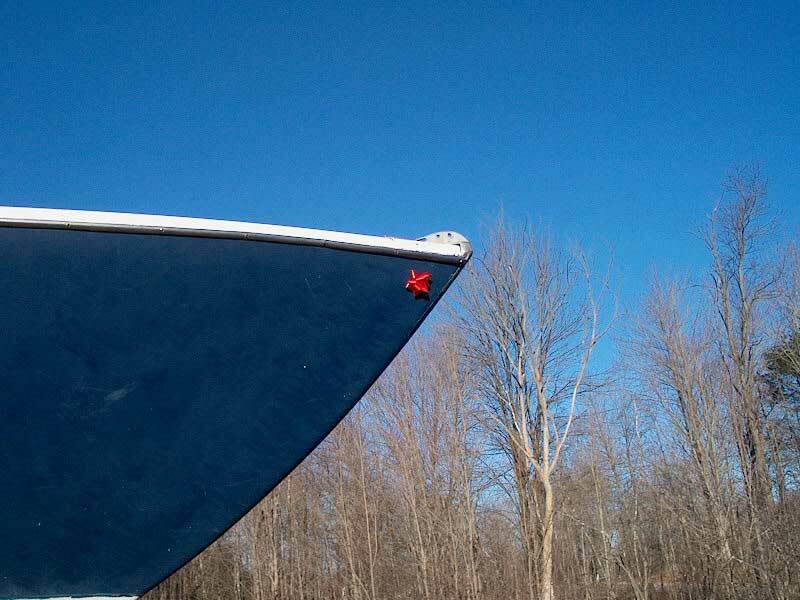 I had to laugh at seeing the boat in the light for the first time at home; down in Massachusetts before the boat was picked up, I noticed that someone had stuck a Christmas present bow--you know, one of those cheap ones that come in bags of 50 for $1.99--onto the starboard bow of the boat. It was still there, after traveling 200+ miles on the trailer! To see more pictures taken of the boat in her freshly-delivered condition, please click here. Please use the control buttons below to watch a slide show of the loading and transportation.